Platte County moved to 5-1 Friday night with a 24-18 win over North Kansas City (4-2), but it wasn’t exactly the way Pirate Coach Bill Utz would have drawn it up. This one, after a somewhat promising beginning on this Homecoming night, became that ugly girl who couldn’t find a date to the dance in a second half filled with mistakes but very few points. That’s unfortunate, as the Pirates really had plenty to celebrate in winning their fourth straight. Quarterback James Valentine moved over the 1,000-yard mark in passing on the season with a three-TD, 251 yard effort. He now has 1,207 yards through the air through six games. On top of Valentine’s performance, the Platte County defense stiffened in the second half, allowing a talented Northtown offense just six points and keeping talented dual threat Marcus Jones fairly bottled up. But back to that ugly girl. Valentine completed just eight of his 25 passing attempts, and had two interceptions. Pirate sophomore kicker Paul Testorff hit just one-of-four second-half field goal attempts when the game was there to be iced. And Jones did end the evening with 124 yards rushing, also topping the 1,000-yard plateau for the year in that category. Should have known this was going to be a bit of a strange one from the jump. Valentine came out throwing early, though not always to his own team. He was able to connect on two long TD tosses, and another of his deep strikes set up a short TD run for the Pirates, lifting Platte County to its 21-12 halftime edge. But the senior QB also threw two balls, under intense Hornet pressure, to NKC defensive back Juante Baldwin, one early in the half and one late. After the teams traded shaky opening possessions – including the first pick by Baldwin – Valentine hit fellow senior JT Taylor with a 40-yard pass to put the Pirates up 7-0 with just over four minutes left in the opening quarter. North Kansas City answered with a 7-play, 65-yard drive, capped by a nifty 44-yard catch and run by Rudy Tyner-Rodriguez on a screen pass from Jones in the near flat. 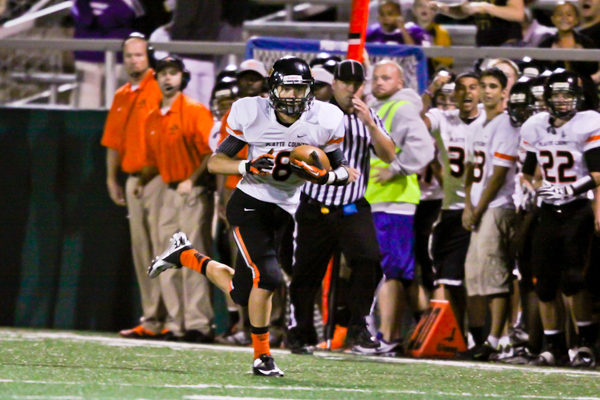 The kick missed, however, and Platte County held on to a 7-6 lead. It was then Valentine’s turn to shine once more. This time he hit Aliek Reed with a 52-yard beauty down the Pirate sideline to give his team a 14-6 edge after the PAT as time expired in the opening quarter. The defenses restored order over the next eight-plus minutes, but Jones ended that with a 44-yard TD scamper that left countless Pirate defenders grabbing at air as he dashed around and through them. Forced to go for two after the earlier missed kick, NKC was unsuccessful and still trailed, 14-12. Cue Valentine again to make another deep strike, this one on a beautiful look off of a defender before he hit Reed with a 61-yarder that was nearly a touchdown. Reed was pulled down at the one, and Charles Leapheart took it in from there to give Platte County its edge at intermission. That brought on the mess that was the second half. Here’s what was sandwiched around Testorff’s one made field goal and the TD by Jones: possessions ending in sacks (1), fumbles (2), missed field goals (3), interceptions (4), and punts (5). And, no, those numbers didn’t belong in front of the description of the type of play. Those numbers were the TOTAL number of times that type of play ended a drive. Yuck. So count Platte County happy to get out of North KC with a victory. “We got out of here alive and that’s about it,” Utz said.